The concept of repetition isn’t new, nor is the simplicity of subject matter. Artists have long been expanding on these inspirations. Think Warhol. 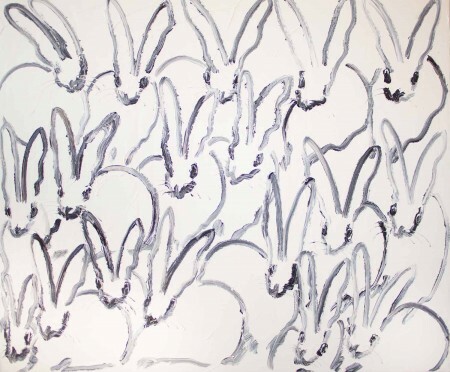 Hunt Slonem’s chosen milieux of birds, bunnies, and butterflies for his exhibit at Miller Gallery comes as a shock at first glance, begging familiarity and exploration before deciding their artistic value. Slonem became part of the Warhol scene in the 70’s, exposed to the value of repetition and invaluable contacts, most certainly aiding in his first solo exhibit just 5 years after his arrival in New York. From there, he proceeded to an impressive list of awards and purchases including National Endowment for the Arts in 1991. His career advanced steadily as museums and private sales continued among influential collectors and curators. pulls the scattered butterflies into the surface by carving into the finished piece, butterflies and all, yielding a shadowy dreamscape of color, avoiding the impression of design. As for the bunnies, they are everywhere. Squeezed into the picture plane, always facing the viewer, ears up in awareness, or single bunnies on “The Bunny Wall” they are the mark of Slonem art. Slonem’s personal preference for wild color and affluent decor are here in the form of antique picture frames on these smaller works, obtained through purchases from southern plantations. They lend the wall a curious installation quality. By looking through the reading material in the gallery, it becomes obvious that a penchant for arranging his art would lend itself easily to that display form. The wall paintings feature one bunny per frame. Simpler and speedier than larger works, the multiple images relate to each other well, each different, but comfortable in the placement. 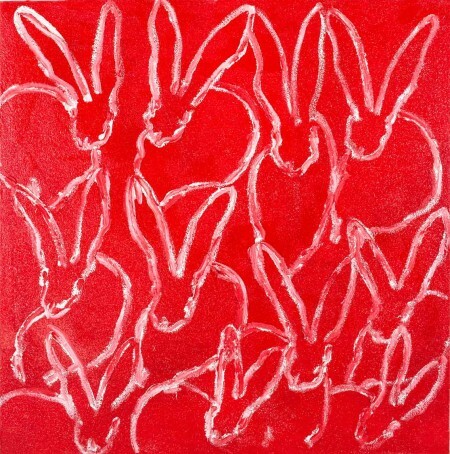 bunnies on solid color backgrounds sparkling away are eye-catchers, pulling the viewer in to become actively engaged with the entire painting. 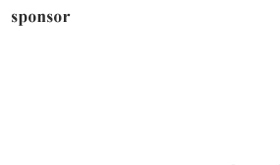 Birds shown as simple oblong factors say design more than any of the other subjects shown. Pleasing in their numbers, perched in rows across the canvas, these are a part of Slonem’s life. They are his companions in his studio, obviously instrumental to his close touch with nature. He arranges them on canvas in regimented rows, while allowing each a certain individuality through color, position and paint quality. 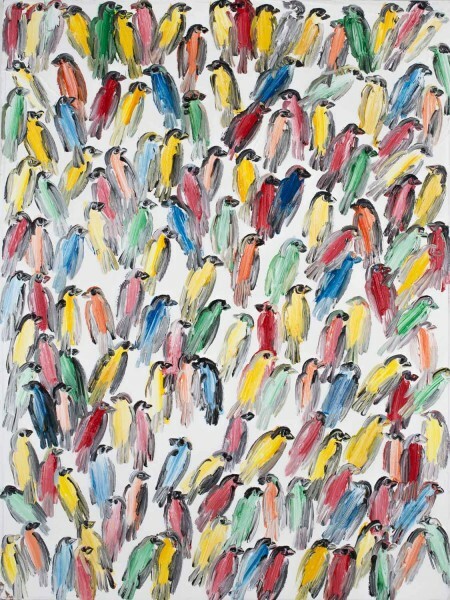 “Untitled (finches)” best illustrates the possibilities of covering the canvas with a variety of colored birds, their close arrangement approaching abstraction. Realizing the abstract element in these works is a piece of cake. Slolem’s splashy paint style combined with his love of color comes close to pure abstraction when he adds flowers to his images. One can easily see the freedom he enjoys when he lets loose with pure color. 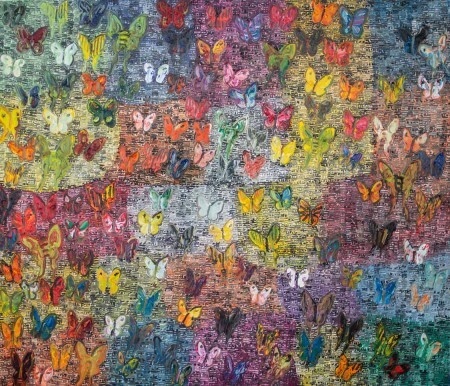 Check out “Untitled (multi-colored butterflies)” for the epitome of this feature. Here the butterflies are made a secondary subject, while the roaming areas of color take precedent. Two pieces introduce metallic paint. Often metallic paint induces the same reaction as glitter when initially encountered. These two offer a special example of expression as the brush marks in the shining surfaces speak of immediacy, which, indeed, is the hallmark of expressionism. Artists and art aficionados often become stuck in their own preferences. Take a walk on the wild side and see this show. It won’t change your minds, but it will make you think more about art’s direction.